White shading on the clouds before start lining. Hi, your 21 Tara Thangka looks very beatiful and I wonder whether you would so kind to answer a question. It looks like you are following the Longchen Nyingthig lineage. 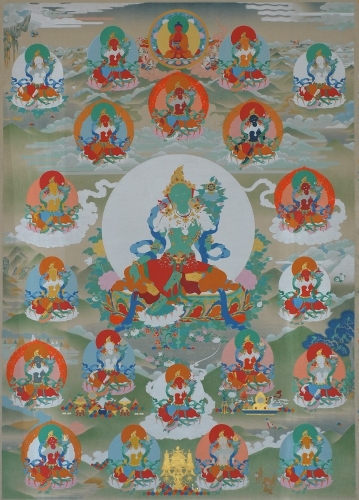 I am in the process of provisioning an applique version of this Thangka and I am wondering about the layout of the 20 Taras around the main green figure? How did you decides that? 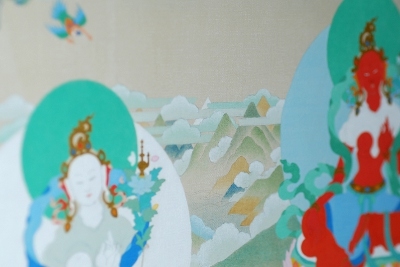 Yes, you are right, this thangka is 21 taras of Longchen Nyingthig. I have checked many thangkas and sadhanas before I start this and one of them is the text from Dilgo Khentse rinpoche. In that text it is said that there is a main green tara at the center and 20 taras around her making 2 circles of 10 taras. And the first Tara sitting in front of main Tara. I hope this is what you asked and will help you. By the way, thanks to you I've found that many images of English version of the blog is not showing. I'll correct it. Thank you. yes this is helpful and I have send this layout to the workshop in Dharamsala that will be producing the applique version. btw. Is the piece you are working on a commission? Are you planning to make prints? 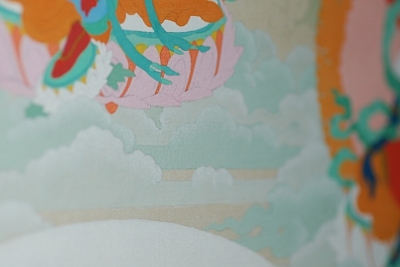 I'm painting this thangka for a Buddhist center and yes, I will make the reproduction of this thangka. please sign me up for the largest print you plan to make. Do you allow visitors to your workshop? I migth be coming to Europe soon and Malaga has one more big attraction for me. O.K. I'll let you know when the repro. is done. I'll send an e-mail to you about visiting my place.